Tie a roll of string into knots to make a climbing net that your bird will squawk about! Cut lengths of string, fold each length in half and knot the folded string onto a wood dowel. Continue knotting folded lengths of string along the dowel and begin knotting the strings together to make a net. 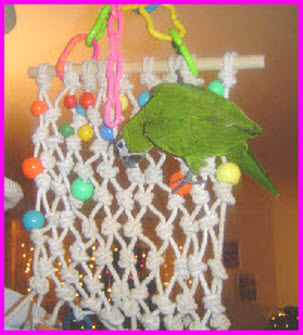 Attach colorful beads and toys to the net as you weave and hang the net in your bird, rat or hermit crab cage.